This hearty one-pot meal combines mushroom and barley with fork-tender pot roast. Heat oil in Dutch oven over medium heat until hot. Brown beef pot roast; remove. Season with salt and pepper. Add mushrooms, onion and garlic to Dutch oven; cook and stir until onion is lightly browned. Add broth and bay leaf. Return pot roast; bring to a boil. Reduce heat; cover tightly and simmer 1-1/2 hours. 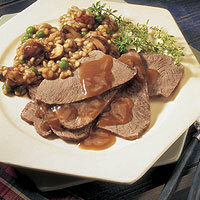 Stir in barley; continue cooking, covered, 45 to 60 minutes or until pot roast is fork-tender. Remove pot roast; keep warm. Discard bay leaf. Add peas and sour cream to barley. Cook and stir over low heat just until heated through. Carve pot roast. Serve with barley.